Roop Dhillon (ਰੂਪ ਢਿੱਲੋਂ) is an Accountant by day and a Punjabi writer by night. He has had four books published to date, all in Punjabi. Details of these books can be found on wikipedia. Roop is unusual as he is an Englishman born and raised, albeit of Punjabi descent. He has always been passionate about English Literature and Literature in general. In his teen years he wrote many poems in English. The plan was one day to become a published author in fiction, however in the 1980s he was only been offered the chance to publish stories about arrange marriages and the like. At the time not many British Asians wrote and he did not want to exclusively write about Indian culture. In an ironic twist of fate, a visit to a Sikh Kingdoms exhibition a Roop Dhillon (ਰੂਪ ਢਿੱਲੋਂ) is an Accountant by day and a Punjabi writer by night. He has had four books published to date, all in Punjabi. Details of these books can be found on wikipedia. In an ironic twist of fate, a visit to a Sikh Kingdoms exhibition at the V&A led him to learn about Punjabi. He was already familiar with the language as it was spoken in the UK . He found a book called teach yourself Panjabi at WH Smith’s and within weeks was able to read Gurumukhi. He was disappointed at the way western Punjabis were portrayed in Punjabi Literature and thus began his journey into informally teaching himself Punjabi at home with the end goal to write in it. The result was Neela Noor (ਨੀਲਾ ਨੂਰ) followed by Bharind(ਭਰਿੰਡ) the latter published in India and the first Punjabi collection of Science Fiction as well as being written in Punjabi as spoken by western born Sikhs, coded to the English language. This was followed by the e-book Bathelona, The Return home (ਬਾਥੇਲੋਨਾ, ਘਰ ਵਾਪਸੀ). The experience of writing these books has now meant that he has matured into a Punjabi writer of merit. His latest work, O (ਓ) has only been published in the west, via BLURB as he refused to pay Indian Publishers who operate only in a vanity press environment and notoriously charge exorbitant sums to western based Punjabi writers without ever marketing the book. Depending upon the success of the book in the west, he may consider publishing it in the future in India. Searching the internet, one will find many positive reviews of this book, lauded as the first Punjabi Gothic novel. 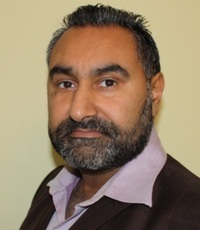 My name is Roop Dhillon ( Rupinderpal Singh) and I can be found on wikipedia...I am a British raised and born author who has chosen to write in Punjabi. My previous work, Bharind, was published in India by Lahore Bookshop and includes some of the first proper Science Fiction written in Punjabi. Excellent. What can I say? It is about our selfish human flaws and the inevitability of it all. It is about hope and despair. But what is really good about it is how it transcends so called genres and cleaverly ( I'm sure the how and why has been dis Excellent. What can I say? It is about our selfish human flaws and the inevitability of it all. It is about hope and despair. But what is really good about it is how it transcends so called genres and cleaverly ( I'm sure the how and why has been discussed by all others) creates so many voices and so many stories that merge and demerge. We’d love your help. Let us know what’s wrong with this preview of Cloud Atlas by David Mitchell.
" This is a really enjoyable book. In my view it is Japan’s answer to the Musketeers trilogy, but all wrapped in one volume. The translation is very mod This is a really enjoyable book. In my view it is Japan’s answer to the Musketeers trilogy, but all wrapped in one volume. The translation is very modern and easy to read and I would recommend it to everyone. It is a long book. It has certainly inspired me to write my own take on Mushahi’s legend in Punjabi… ...more "
We’d love your help. Let us know what’s wrong with this preview of Musashi by Eiji Yoshikawa. Busy writing most of the time so rarely get to read...have so many books on the list, but as I a writing a Punjabi novel about Musashi it made sense as part of research to read this and I am 3/4s through and have to say it is a very good book..